For John Friedmann, his recent visit to the UCLA Luskin School of Public Affairs offered an opportunity to renew ties with some of his former colleagues and many friends. 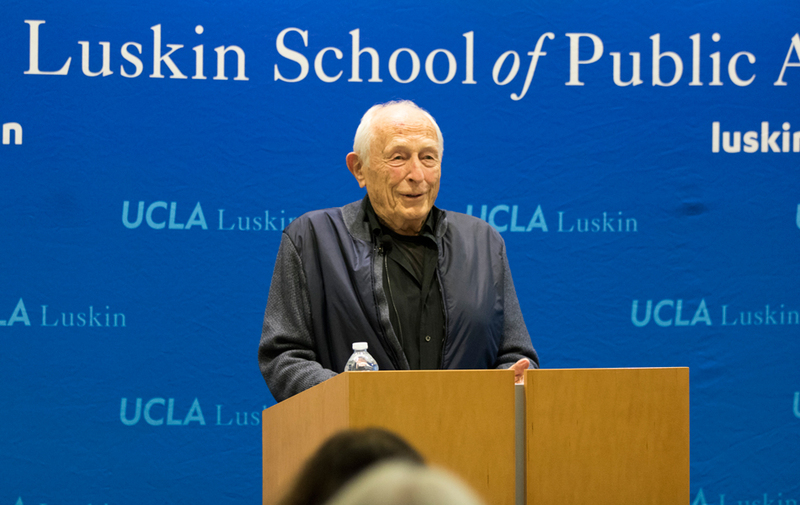 For Luskin students, faculty, staff and alumni, it was a chance to welcome, embrace, honor and learn from a legend in urban planning. In the 1960s, he was one of the founders of the UCLA Urban Planning program, now a department within the Luskin School. “For several decades, the program was synonymous with John Friedmann,” Roy said. And he’s won many awards, including the Distinguished Educator Award presented by the Association of Collegiate Schools of Planning (ACSP). “There is also now a John Friedmann Book Award at ACSP,” Roy said. During his lecture, “The Ruse of Reason: Poverty, Inequality and Personal Freedoms in the People’s Republic of China 1950-2015,” Friedmann covered the 65 years that the Chinese Communist Party (CCP) has been in power. Lifted hundreds of millions of peasant farmers out of poverty. Achieved its transition to an urban society, rising from 12 percent at the beginning of the period to more than 50 percent at present, while planning to urbanize another 300 million within the next two or three decades. Achieved home ownership for more than 75 percent of residents of urban households, excluding migrant workers. Lengthened the average lifespan to more than 75 years. Abolished illiteracy, making nine years of education compulsory and enrolling 12 million students in postsecondary education. “As a result, the People’s Republic of China stands on the threshold of becoming a global power,” Friedmann said. But the statistics mask a much more troubling trend in China. Friedmann viewed the 65 years through the lens of three political cycles, taking listeners back to when Mao Tse-tung assumed control of the country. In the second cycle, initiated by Deng Xiaoping, “the state promotes economic growth as the first priority,” Friedmann said. “China becomes a producer for world markets — by the end of the cycle, second only to the United States in total production. But the costs incurred are heavy. China ranks among the group of countries with the highest indices of income inequality worldwide. “Serious damage continues to be done to the collective resources of air, water and land, endangering peoples’ health and well-being,” he added. “An insipient class system emerges.” Middle-income sectors are the principle beneficiaries of public policy and the enjoyment of personal freedoms extends disproportionately in comparison to the indigent population, which remains statistically significant. The challenges left behind by the two previous cycles have now been passed on to a new generation of leaders headed by Xi Jinping, who has launched the third political cycle of CCP rule under severe economic restraints, even as the country attempts to position itself as a global leader. Before his lecture, Friedmann reflected on his time at UCLA as a founder and as the chair of Urban Planning for 14 years. “I rather enjoyed being in that leadership role,” he said. “The vision that I had was that planning at the local level was not just a profession. Urban planning is a concept that is not all that clear and encompasses larger and larger areas. I transitioned from rural, perhaps, to a more urban set of functions. 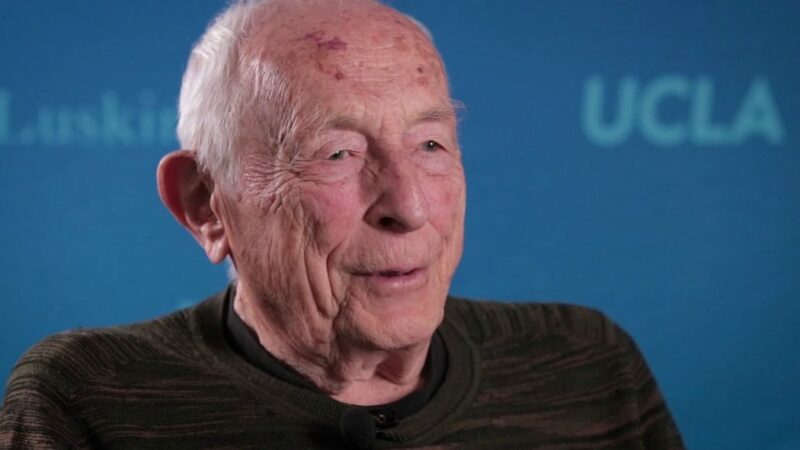 Friedmann arrived at UCLA in 1969 and he smiles when asked what he thinks about how Urban Planning has blossomed into a strong, influential department within the Luskin School of Public Affairs.